Our Manuka Essential Oil is harvested in the wild. Herbal Folk Traditional uses for Manuka is a long list of applications because of its effectiveness against bacteria, fungus and viruses. Manuka is known for is antiseptic and immune stimulating properties. It has a rich, herbaceous scent different slightly from Tea Tree. Red Manuka blends well with Basil, Bergamot, Black Pepper, Chamomile, Clary Sage, Cypress, Eucalyptus, Geranium, Grapefruit, Lavender, Lemon, Litsea Cubeba, Marjoram, Orange, Patchouli, Peppermint, Petitgrain, Pine, Ravensara, Rosemary, Sage, Sandalwood, Tea Tree and Thyme. Manuka is steam distilled from the plant leaves. 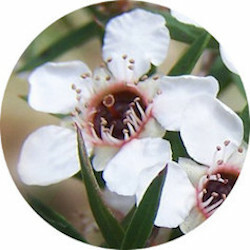 Manuka Essential Oil has the following actions: analgesic, anesthetic, antibacterial, anti-fungal, anti-inflammatory, antimicrobial, antiseptic, antiviral, deodorant, expectorant, immune stimulant, nervine, sedative and vulnery.